It can be difficult to see aspects of your own identity clearly without a contrast. As an Englishman amongst the English it’s hard for me to understand many aspects of my own Englishness. In the same way, without comparing myself to other people, I can’t accurately fathom my own personality. And so travelling is not just a chance to relax, eat out and take in the sights, but it’s an opportunity to get some perspective. Returning this week from the Norwegian capital, Oslo, I was struck by how easy it is to stereotype other cultures and assume our own is unique. There are two stereotypes about Norway: it is cold and depressing. These are often combined to arrive at the idea Norway has a high suicide rate because of the cold weather. In fact Oslo, which is in the south of Norway, has a similar climate to London in June, July and August. Norwegian suicide rates, while higher than the UK are certainly not off the scale – they are comparable with those in the US and lower than those in Australia. Indeed Norway often comes near the top of tables for the happiness of its inhabitants. 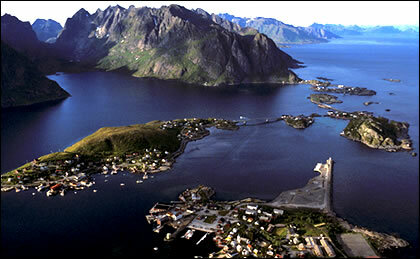 If Norway isn’t always a cold depressing country then what kind of a country is it and how can I tell? In many ways a city is a manifestation of its inhabitant’s beliefs and attitudes, or at least a history of what they used to be. It’s possible to read a city in the same way it’s possible to read a person’s expression. It turned out that Oslo had much to teach me about Norwegian culture. After all, the city environment is an expression of culture, a way of the city’s inhabitants revealing themselves. What does the city we live in say about us? The first thing that struck me was that cyclists and pedestrians rule the city rather than cars. At every corner there is a pedestrian crossing, people drive around the city slowly and, almost without exception, will stop when you want to cross the road. Back in the UK people pay lip service to sustainable forms of transport but what do we actually have? Ridiculous cycle lanes, roads jammed up with cars, a belief that it is everyone’s right to drive up and over anyone else’s head. And what an acquisitive society we have in London. Looking at the cars people are driving in Oslo, I was wandering around the city for three days before I saw a show-off yellow sports car. In London the Porsches and Lamborghinis are nose to tail. You only have to walk around Oslo or indeed any other town in Norway to realise that these people understanding something about design. There is a flow between commercial buildings, public facilities and the natural environment. I’m not just talking about an artsy-fartsy ascetic, I’m talking about practical usability, the difference between a public space being an obstacle and a pleasure to navigate. The famous Scandinavian design is in evidence everywhere. There is much more attention to functionality, simplicity and common sense. Doors, light-switches, toilets, fridges, heating and glazing. You name it, I saw better design and usability in Norway than in the UK. Finally every English person’s favourite subject: money. One stereotype in Norway that is certainly true is the high cost of…just about everything. My personal cost of living index, the price of pint of beer, broke all previous records. How does £8 a pint strike you? Hence no gangs of inebriated idiots. But in defence of Norway, here’s a culture that understands that you get what you pay for. You want to do it on the cheap? For the most part you get London: often dirty, smelly and unpleasant. You want to pay for quality? You get Oslo: clean, efficient, odourless (apart from the fish) and very pleasant. We in the UK, however, live in the something-for-nothing culture. We want to cut the corners, make a fast buck, get there first, wherever there is. Hang the design, how cheap can you make it? Depressed as I was, then, to return to England, I did so understanding more clearly what it means to be English. The Norwegians are people connected to their landscape, to their natural environment; people who care about design and don’t think cars are the symbols of freedom their manufacturers would have us believe. English culture is largely the reverse.